Minority Speak supports a Detroit family’s effort to turn the loss of one bright future into an opportunity for many other’s to succeed. Please support the Cedric Ellington Gill 1st Annual Scholarship Foundation Banquet. God Bless and Kindest Thanks! 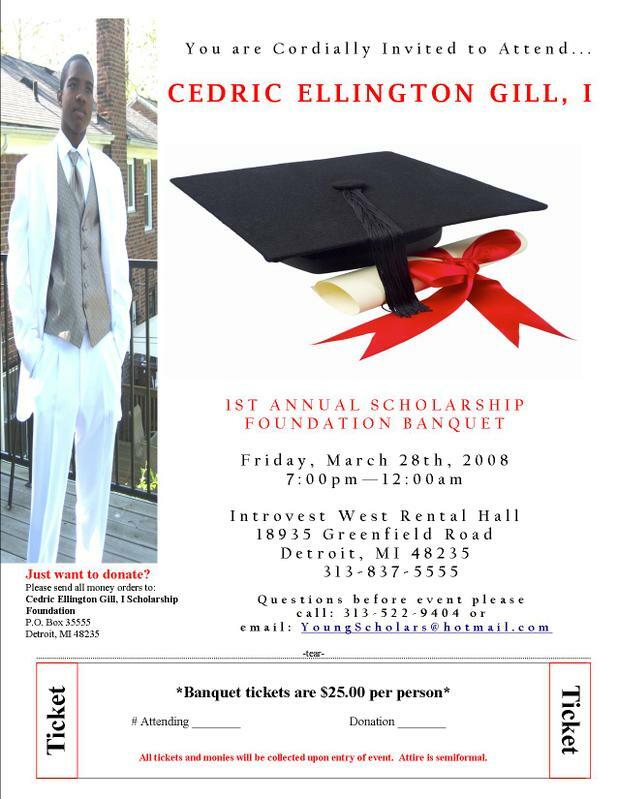 You are cordially invited to attend the Cedric Ellington Gill, I Scholarship Program Banquet. All proceeds from this program will help to sponsor Youth in their quest to enter college, universities, or trade schools. This Scholarship can probably help your Children, Sisters, Brothers, Cousins and Friends to enter college, universities, or trade schools. The more people this Scholarship can help. The more we keep this young man Cedric name and dreams alive. So please come join us at this event we will greatly appreciated it. This can also be a blessing for you and your family.